Authoring an Esri Story Map Tour app is now as easy as downloading Esri's new Snap2Map app on your smartphone. Created by Esri Labs, the Snap2Map app takes your geotagged photos and publishes them directly in your ArcGIS Online organizational account as an interactive Map Tour app. You can also add an Esri basemap of your choice and descriptive text. You can even share your Map Tour app via social media or e-mail using Snap2Map. Read the article. 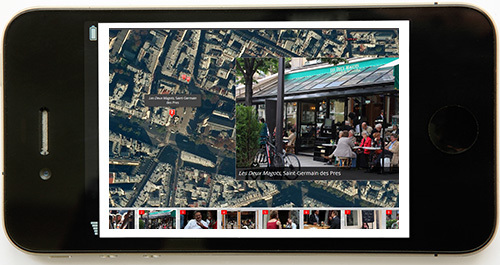 You can create an Story Map Tour app like this one of Paris cafés with the Snap2Map app. Tools in the new USGS Historical Topographic Map Explorer let you compare maps from different time periods and see changes. Esri's Nancy Morales and Aileen Buckley show you how to get the most out of this handy app, developed by the United States Geological Survey and Esri. Read the tip. Esri is offering free ArcGIS Online subscriptions to every K–12 school in the United States. Digital mapping could help up to 48 million students develop spatial and analytical-thinking skills. Read the article and get involved. In seismically active California, Esri ArcGIS is being used to inform people about damage to homes and infrastructure caused by earthquakes and to chronicle stories about the state's legendary temblors. Read the article. Texas A&M Forest Service and Esri partner Timmons Group developed a GIS mobile app to assess trees for trimming or other maintenance—before a storm hits. Read the article. Esri just released a new version of CityEngine that includes many new features and improvements. Read the blog. Get a free 30-day trial. Esri now offers Explorer for ArcGIS on Mac OS X in 22 supported languages including Arabic, Romanian, Finnish, and Korean. Read the blog. There's plenty of ready-to-use content that comes with your ArcGIS Online subscription including basemaps, routing, geocoding, Esri's World Geocoding Service, and a live traffic map. Read the blog. This Esri Story Map app shows drought-related information for the United States, including current conditions and change in soil moisture. View the Story Map app. While some data may be open, it's not always particularly useful to your organization or company. ArcGIS Online makes data easy to find, access, explore, and share. Do not get trapped in four of the most common data dilemmas. Read the article. The free ArcGIS for Server on Azure Starter Package includes instructions and a set of workflow-driven scripts for quickly deploying ArcGIS for Server on Microsoft Azure. Watch the video. With just a little customization, you can create your organization's unique ArcGIS Online home page description. For example, you can add workflow resources. Read the tip. At the Esri User Conference, Esri president Jack Dangermond challenged everyone in the audience to become geodesigners. You can be one, too. But first you need to know geodesign concepts and techniques. Take these courses. Need a data report fast? The new Esri Reports gives you demographic, lifestyle, and spending reports for any US location based on Esri Demographics data. Buy Esri Reports. Get more high-resolution imagery coverage with the new release of Data Appliance for ArcGIS. This solution, for US customers only, contains content similar to ArcGIS Online services but operates behind your firewall. Order Data Appliance for ArcGIS. Joseph K. Berry's Beyond Mapping columns in GeoWorld magazine are now online books. Sections include GIS concepts, spatial reasoning, map analysis, and GIS modeling. Read the blog and access the books. 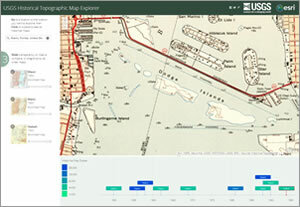 Specialty map store Maps.com uses the ArcGIS platform and content and its own cartography to create its map products. Maps.com provides maps for the home, school, and office. Listen to the podcast.